Amit Chauhan (29), a businessman dealing in artificial jewellery, was allegedly abducted from Delhi where he had gone for some business earlier this month. To strengthen security at Sri Guru Ramdas Ji International Airport, categorised as hyper-sensitive, the Airport Authority of India (AAI) and the Central Industrial Security Force (CISF) have decided to deploy four canines as part of the dog squad. Deputy Commissioner Rajat Aggarwal and his wife Ritu Aggarwal inaugurated the polio immunisation drive from Baba Deep Singh Charitable Hospital today. The Civil Lines police today arrested Vimal Kapoor and his son Parth Kapoor, for their alleged involvement in betting on the cricket match between India and Australia, besides the winning prospects of the candidates of various parties in the recently concluded assembly elections in Punjab. Musician and Hindustani classical maestro Salil Bhatt is the new face of Indian classical music. Hailed as a global Indian, Salil has done it all, from solo concerts at the most sought after venues like Smithsonian, Iceland and German Parliaments and Epcor Centre in Calgary, international collaborations and nominations to exotic jugalbandis. The police department has decided to set up nakas to check smuggling in arms. DIG border range Ram Singh has directed all the police border districts under the range to check illegal weapons in their respective police districts. The private contractor, who got the multi-storied parking lot in Nehru shopping complex on the Lawrence Road on a lease, ran away just two months after getting the contract. These two months made him learn that managing this parking lot is not a profitable business. As many as 52 students of Guru Nanak Dev University and other institutes were awarded scholarships by the Nishkam Sikh Welfare Council of the Guru Nanak Dev University Branch in association with Sikh Human Development Foundation, US. University registrar Dr Inderjit Singh gave away the scholarships to students. The scholarship is given to students who perform well in the written test and interview conducted by Nishkam Sikh Welfare Council. Without salaries for the past four months, the rural veterinary officers working under the zila parishads have threatened to launch an agitation against the state government. 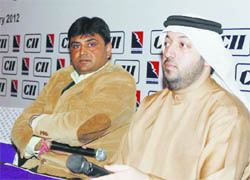 The Confederation of Indian Industry (CII) organised a seminar on “Hamriyah: A Top Destination for Doing Business in Arab and African Region”, in the holy city on Saturday. Addressing local industrialists, Hamriyah Free Zone (HFZ) Authority Director Saud Al Mazroueeill elaborated that HFZ in Sharjah (UAE) has evolved into a model of sustainable development and inclusive growth by attracting over 5,000 investors from across the globe up to 2010 during the past 15 years. With a view to offer passenger-friendly services, DIG (northern region, airports) of Central Industrial Security Force KN Tripathy inaugurated baggage weighing facility at Sri Guru Ramdas Ji International Airport. Amit Chauhan (29), a businessman dealing in artificial jewellery, was allegedly abducted from Delhi where he had gone for some business earlier this month. However, the victim’s family reported the matter to the police today. The police has registered a case under Section 364-A (kidnapping for ransom) of the IPC and further investigations are on. Kanwal Chauhan, victim’s father, told the police that his son Amit Chauhan, who used to trade in artificial jewellery, had gone to Delhi on February 3. In the evening that day he called his family that he had reached Delhi. Thereafter, his mobile phone has been switched off. On February 11, the family received a call from “kidnappers” who demanded Rs 25 lakh as ransom saying that they had abducted Amit Chauhan and that they would give details of the place where the money was to be delivered later. As the family pleaded that they don’t have the money, the kidnappers called up again and demanded Rs 3 lakh. They said they will tell the family the place where the money was to be delivered. However, they did not call up again. 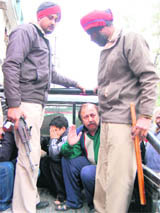 Kanwal alleged that on February 15 the accused said they had thrown his son’s body after killing him at a bus stand. Harjinder Singh, SHO, D-division police station, they were investigating into the case. Amit used to go to Nepal for business, he said. As the body has not been recovered yet, therefore no murder charges have been added. He said the family still receives calls from the alleged abductors regarding the ransom. “We are investigating the matter from various angles and no stone will be left unturned to recover the youth,” he said. DIG Northern region Airports KN Tripathy, who is looking after the security of Amritsar Airport apart from 13 other airports of the northern part of the country, said a dog squad comprising four canines will be deployed here within the first quarter of the next fiscal year. He said these dogs are currently undergoing training at Bhanu near Panchkula. He said the dogs will also be trained in detecting explosives. He said the sniffer dogs will be deployed by June end. He said besides, electronic bollards will be installed at the main entrance of the airport. Airport director Sunil Dutt said after conducting a fresh survey and to tighten the surveillance, position of 85 CCTV cameras, operational in the airport has also been changed. A public grievance centre has also been activated with signs informing the passengers regarding the service installed at all counters of the airlines operating from the airport, he said. He said to offer quality services to the passengers, seven Reverse Osmosis (RO) systems with water softener have been installed to supply potable water. He said potable water under 1 to 150 pints of the Total Dissolved Suspended Particles (TDS) is considered fit for human consumption and is being maintained below 100 points. He said gadgets to verify purity level were available at the Airport to carry out daily purity checks. Besides, signage has been installed to guide passengers to different facilities and their qualities, he added. Deputy Commissioner Rajat Aggarwal and his wife Ritu Aggarwal inaugurated the polio immunisation drive from Baba Deep Singh Charitable Hospital today. He administered polio drops to infants to launch the drive. On the first day of the drive, 1, 87, 864 children were immunised. Civil Surgeon, Amritsar, Dr Manjit Singh Randhawa, and various other senior health officials were also present on the occasion. Aggarwal also issued instructions to the health officials to keep a strict vigil on the teams entrusted with the duty of administering anti-polio drops. The district health officials also gifted toys to small children coming to the booths, said Dr Randhawa. In the door-to-door campaign over the next two days, every household will be covered, he said. He said 3,000 teams of the health staff and volunteers will be involved in the door-to-door campaign. Deputy Commissioner also thanked the representatives of NGOs and other organisations for their support to the polio immunisation drive. The police recovered three laptops, mobile phones besides dairies from their possession. A case under section 13/3/67 of the Gambling Act and 420 IPC has been registered against them. Acting on a tip off, the police raided the residence of the accused on Madan Mohan Malvia Road in the afternoon. Sukhwinder Singh Randhawa, SHO Civil Line police station said names of a dozen more persons have come to light during the preliminary investigations. He said further investigations in the case were on and more recoveries are likely to be made. The D-division police had recently booked six bookies on similar charges. 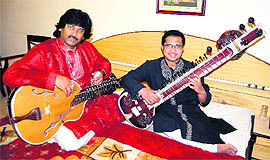 Musician and Hindustani classical maestro Salil Bhatt is the new face of Indian classical music. Hailed as a global Indian, Salil has done it all, from solo concerts at the most sought after venues like Smithsonian, Iceland and German Parliaments and Epcor Centre in Calgary, international collaborations and nominations to exotic jugalbandis. He likes living life out of the suitcase. “I will call my life a classical chaos. With so much travel and neck deep in work, I forget if I am sleeping empty stomach or performing at 2 am in the morning,” says the artiste who is in Amritsar to perform at the annual music festival organised by Swar Sangam. “We lack the respect for our own culture. A civilization with over 25,000-year-old culture of arts and music, we totally lack self-belief.” The reason: “It took a Grammy win for people to start take notice of my father’s music and 18 years after, we are still at the same point. 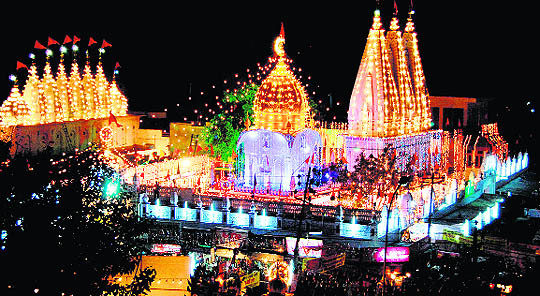 There is always a foreign stamp of approval or recognition for out culture required to make Indians like it,” he says. “The level of work being done by Indian artistes and talent we have in classical music is huge. Earlier generations didn’t commercialise it and so today people don’t find its worth, until some foreign label comes attached to it,” he feels. His own career path took a turn after his international projects. “I have students from Germany, Fiji, UK, Canada and Japan. Foreign artistes find Indian classical music as global as can get.” He has also released his album ‘Be comfortable’, in continuance with his series of natural and comfort music. “The ragas and compositions in the album are soothing, relaxing and spiritually calming. Raag Jogeshwari, Raag Bhairavi have a soft approach to them and comfort music is the next big thing to happen internationally.” Treating music as a therapy, he has high hopes with the albums. Salil Bhatt is the face of eternal hope for Indian classical music for sure. Ram Singh said all the police districts falling in the range, including Amritsar rural, Tarn Taran, Gurdaspur and Ferozepur, have been directed to set up nakas regularly to arrest the persons who were in possession of illegal fire arms. “All the district police chiefs, SPs, DSPs and SHOs have been instructed to expand their information network and keep an eye on the smuggling of illegal firearms in their respective areas,” he said. Easy availability of illegal firearms has pushed the crime rate in the region up and the police authorities as well as the residents have expressed their deep concern over this, he said. Snatchings have become order of the day while daylight robberies by assailants armed with country-made weapons have also become a major threat. “The firing incident in the school premises by a student is an eye opener which clearly indicates towards the easy accessibility of illegal country-made weapons to the people especially the anti-social elements,” said the DIG. He said there is need to break the nexus of the persons involved in the smuggling of illegal weapons from states such as Uttar Pradesh and Rajasthan known for manufacturing of country-made arms. Meanwhile, SPS Parmar, district police chief, Amritsar rural police, today claimed to have achieved significant breakthrough in the firing incident. “The police has achieved a breakthrough in the incident and the students involved in the incident will be nabbed by tomorrow,” he claimed. Vehicles move at a snail’s pace on the road. The famous hangout place - Lawrence Road - is a place where just chaos prevails. With residents developing a habit of not using spacious parking lots, the roadsides turn into parking spaces till the shops remain open at night. The four-storied parking remains nearly empty. Vehicles parked on the roadsides become a reason for traffic blockade on the entire stretch of Lawrence Road and even beyond. In most of the market blocks of the newer and posh Ranjit Avenue, spacious parking areas are available. But residents it seems do mind parking their vehicles on designated spots. The Mall Road where there are showrooms of the elite brands too is not free from this chaos. Though few of the shopping complexes have underground parking areas, visitors are fond of the roadsides when parking their vehicles is concerned. Residents said the traffic police should see that people don’t park anywhere and everywhere. 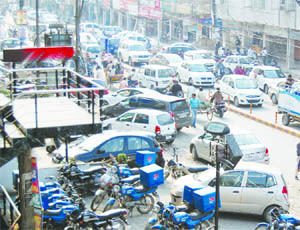 The problem of roadside parking is more severe in areas along the GT Road. A senior citizen, Gurdial Singh, commented, “The situation will not change, until and unless traffic police issues challans for wrong parking.” To add to the problem of parking, hundreds of auto-rickshaws in the city also do not have designated places for pick and drop passengers. ACP (traffic) Karanjit Singh said two policemen are deputed on the Lawrence Road to regulate traffic. The traffic pollice also challans violators. As many as 52 students of Guru Nanak Dev University and other institutes were awarded scholarships by the Nishkam Sikh Welfare Council of the Guru Nanak Dev University Branch in association with Sikh Human Development Foundation, US. University registrar Dr Inderjit Singh gave away the scholarships to students. The scholarship is given to students who perform well in the written test and interview conducted by Nishkam Sikh Welfare Council. Dr Inderjit Singh said education has become very expensive. As a result of which many talented students are deprived of education. He appreciated the work of the Nishkam Sikh Welfare Council for providing scholarships to the deserved and meritorious students. He also exhorted students to work hard with dedication to achieve what they wish in their lives. B.S. Sekhon, branch president of council, said the council has been running all its welfare programmes through donations from India and abroad. The council is a registered NGO which receives financial assistance from Sikh Human Development Foundation Inc, New York (USA), to award these scholarships to the needy students in colleges and universities. 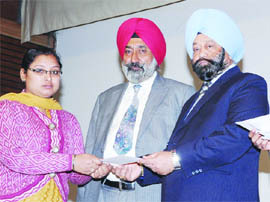 The council also distributed 350 scholarships among students in Chandigarh, Ludhiana and Faridkot. After a meeting of the Rural Veterinary Officers Association, its president Dr Navdeep Singh Khinda said they have not got the salaries since September. The state government had regularised the services of veterinary officers in May last year as a result of which their monthly pay was also revised. "As the Rural Development and Panchayat Department did not care to arrange additional funds, the existing fund exhausted in September," said Khinda demanding that the salaries to the employees should be disbursed on a regular basis. Puneet Malhotra, association treasurer, said the officials at the department do not give any satisfactory reply to our queries. He said HFZ has become an important investment destination in West Asia as it offered total ownership of business and repatriation of capital and profits. There were no taxes or duties. Application of one-stop-shop concept for quick issuance of licenses, and visa solution with Free Zone sponsorship of business owners and their employees, were the other positive factors that favored the investors. The HFZ, which is strategically located connecting three continents, has 38 per cent (about 190) companies are Indian out of the 493 companies that started operations during the last four months of 2011. He said it rose the overall presence of Indian companies in the HFZ to about 25 per cent. CII Zonal Council Chairman Suneet Kochhar, also Director of Khanna Papers Ltd, said HFZ provides space for local investors to go global. He said already a local industrialist Anudeep Singh had opened their operation at the HFZ. 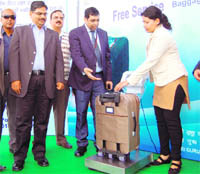 The machine has been installed by the Airport Authority of India (AAI). It will employ three persons to run the round-the-clock facility. He said the facility will offer assistance to passengers to limit the weight of their baggage as per the guidelines of different airlines. Airport Manager Sunil Dutt said passengers would be educated about the facility and the information would be available on vehicles parking tickets. Dutt elaborated that the facility would be free for the first month.